The death July 3 of co-founder and chief executive officer of the troubled HNA Group financial conglomerate remains shrouded in mystery despite the ruling by French judicial and police investigators. "The investigation into the circumstances surrounding the death of Mr. Wang Jian is now complete," High Court Prosecutor Philippe Guémas told the Washington Free Beacon Oct. 5. "It did not disclose evidence of any criminal act," he stated in an email. "Mr. Wang was alone when he climbed the wall, lost his balance, and fell to his death on the other side." Earlier, French police Lt. Col. Hubert Meriaux, commander of the Gendarmerie in nearby Vaucluse, France, said the initial theory of investigators at the scene was that Wang died from an accidental fall. Wang was a key leader of the HNA Group that is worth an estimated $230 billion and owns stakes in Deutsche Bank, Hilton Hotels, and Swissport. According to the official version of events, Wang died after falling some 50 feet off a rock wall during a visit to a 12th Century church in the hill village of Bonnieux, a popular tourist site in southeastern France. The circumstances surrounding Wang's death were the subject of an investigation by two former New York City police detectives who uncovered facts about the case that appeared to have been left out of French authorities' probe of the matter, or that contradict the official version of events. For example, the former detectives discovered that Wang was not alone at the time of his death and visited the French church with an entourage that included two Chinese government-supplied security guards who attempted to treat Wang after the fall. The group also included a French-Chinese translator who was the first to seek help from a nearby restaurant in the village. Gaétan Delforge, a Frenchman who was working at a restaurant in the village, said he recognized Wang's group that he passed on his way to the village. The group included five people, including Wang, two men and a woman who had passed him on the street, he said. A short time after they passed the restaurant, the woman, who was not identified by name, came into the restaurant and made an urgent appeal. "So I was at the restaurant, where I was working," Delforge said. "The lady came running down. The same lady that I had passed a few minutes beforehand, she came running down, yelling: ‘call the fire department, he jumped.'" Pressed for details, Delforge said the woman said either "he jumped" or "somebody jumped" and to immediately call the emergency first responders. Delforge also was the first person to witness Wang after the fall. He said when he arrived at the base of the wall, two Chinese men were attempting to treat Wang, who was still alive, and several times pinched his cheeks in an apparent bid to treat him. "I tried to grab his neck, I tried to put him in the [recovery] position but [the Chinese guards] were especially against it," he said. "I felt like these people were protecting him." The former detectives also said they uncovered additional suspicious details surrounding Wang's death. The two former detectives disclosed the findings of their private investigation to the Free Beacon on condition of anonymity because they are still involved in some official police work. "The official story is that he went to go take a selfie," said one the detectives. "We were at the wall. I could tell you right now, I could push that wall over. Nobody in their right mind would ever climb over that." A second detective said after investigating the case: "All the bells and whistles have gone off." Accounts from police about the incident varied. Some reports indicated Wang ran up to the wall and jumped to get on top of it but tumbled over instead. The detectives said their investigation disclosed that surveillance videotape of the village was altered. A portion of video taken during the time that Wang arrived at the Bonnieux church appears to have been deleted by police who obtained the video from the village's sole camera at the location in a tobacco shop. The detectives obtained video from a DVR that would have shown Wang's party pulling up to a stone staircase in a van around 10:40 a.m. on July 3. "The video captured at that time frame was deleted," the first detective said. The timeline of the incident also raised the detectives' suspicions. Wang had breakfast at the luxury Hotel Capelongue in Bonnieux and departed around 10:30 a.m. by van for the church that was located about short distance from the hotel. Within 15 minutes, he was at the foot of a rock wall dying. "The timeline only adds to the fact this was not an accident," a second detective said. "Within 15 minutes of them leaving the hotel is approximately the time he's lying at the bottom of the wall dying." French authorities also imposed a strict gag on releasing any information about the incident. Both police and firefighters that were involved in the case told the detectives they were ordered not to comment on the circumstances surrounding Wang's death. Also, travel agents working at the travel agency near Bonnieux that arranged for Wang's stay said they were directed by officials of the Chinese government not to say anything about Wang's death. The detectives said they provided the results of their investigation to the FBI but were told there was not enough information for the FBI to launch an investigation. The Free Beacon was unable to confirm that Wang's body was sent to Seattle where Wang's wife and son live, and where his brother, Wang Wei has been closely involved in HNA's investments. Guo Wengui, a Chinese businessman turned dissident billionaire expatriate, said he doubts the official French government version of events surrounding Wang's death. Guo said he predicted a year ago there would be a murder or assassination within HNA. "The timeline between when Wang Jian left the hotel and jumped or fell down does not match what Chinese propaganda reported, so that is suspicious," Guo said. Initial reports from Chinese state-controlled media reported that Wang died of a heart attack. Also, Guo said he believes Wang's two government-supplied security guards were members of the Chinese military. Guo said several indicators on the case suggest Wang's death may have been the result of a Chinese government-orchestrated hit. Wang's body, according to Guo was sent to Seattle and buried, and his wife and son who live there as U.S. residents have lost billions in Wang's HNA shares that were taken back by the company. "In one to three months, all property [owned by Wang] was moved back to HNA into accounts related to HNA," Guo said. HNA sued Guo in 2017 over comments made by the exiled Chinese billionaire linking HNA to Chinese government corruption, including ties to current Chinese Vice President Wang Qishan. After Guo's disclosures about HNA, the company made a donation estimated to be worth up to $18 billion to a New York charity known as Hainan Cihang Charity Foundation, the New York Times reported. The donation was made by a man identified as an HNA stakeholder Guan Jun who made the donation on behalf of HNA. China has sought to silence Guo through threats, intimidation, and legal action against his employees and companies. Guo was close to former Chinese Ministry of State Security Vice Chairman Ma Jian and knows secrets of Chinese Communist Party corruption and intelligence activities. HNA, for its part, has come under U.S. government scrutiny over its investments and charitable donations in the United States. Wang was said to be under fire from Chinese authorities for his role in making some $50 billion in HNA overseas investments that caused the conglomerate to initiate a major financial restructuring of its debt. The New York-based dissident Chinese outlet Mingjing News reported last year that Chinese Community Party leaders had approved a corruption probe of HNA. In April, HNA gave up a bid to purchase Skybridge Capital, a hedge fund investment company founded by Anthony Scaramucci, who briefly served President Trump as White House communications director. The deal raised suspicions that China was buying Skybridge as a way to gain influence within the Trump administration. Two months earlier, the Free Beacon reported that HNA was facing U.S. sanctions for providing false information to the Treasury Department-led Committee on Foreign Investment in the United States that reviews foreign purchases of American companies. Wang is one of three Chinese leaders linked to the dissident Guo who died or disappeared in recent months. Meng Hongwei, until recently the president of the international police organization Interpol, disappeared during a visit to China earlier this month. Meng, a senior Chinese police official, was behind Interpol's issuing two red notices against Guo. A third case involved the Chinese government official in charge of the casino hub island of Macao, Zheng Xiaosong, who fell to his death Oct. 20. According to Guo, Zheng was behind the appeal made to President Trump last year by casino owner Steve Wynn, former finance chairman of the Republican National Committee, to have Guo forcibly returned to China. Wynn is head of Wynn Resorts that has interests in casinos in Macao. The Macao government office announced Sunday that "Comrade Zheng" was an "excellent member" of the Communist Party but gave no cause of death. Shortly after his death, the Beijing State Council’s Hong Kong and Macau Affairs Office said he had "suffered from depression," the South China Morning Post reported. That report prompted one U.S. official who said the death was suspicious to quip: "The Chinese didn't say what made him depressed." 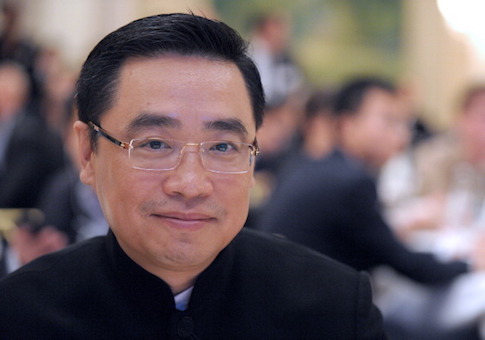 The night before Wang's death, the HNA cofounder had dinner with three people, including Daniel Vial, a lobbyist who had worked in the past for HNA, Sylvie Ouziel, chief executive of the insurance company Allianz Worldwide Partners (AWP) Group, and Hua Bin, a pro-China activist associated with the French China Foundation. "I am certain it was neither a murder nor a suicide," Vial told the Financial Times three weeks after Wang's death.